– When were the CCTVs installed? – What purpose are they for? 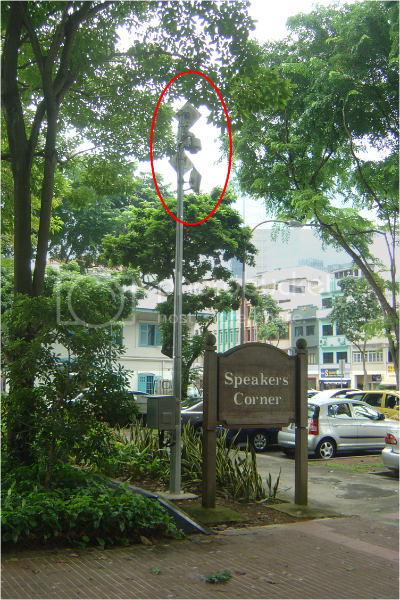 – Did Nparks install the cameras or were they installed by the police? – Does the presence of the cameras contradict the liberalisation of Speakers’ Corner rules as announced by the Prime Minister in 2008? – What was the cost involved in the installation of the cameras? – Who will have possession of the footage of the cameras? – Who is in charge of monitoring the cameras? from holding further events there? The police’s reply essentially is the same as the one they gave to the Today newspaper. See here. I refer to your email of 24 July 2009. Police have installed CCTVs in public areas such as Suntec and Boat Quay. not record audio inputs and are installed for safety and security.